The breed is of recent origin. It is claimed that during the last two decades of the nineteenth century some of the Rajas of the Southern Mahratta country which lies in the watershed of these rivers tried to evolve a powerful bullock for agriculture purposes in the sticky black cotton soil. It is claimed that Gir cattle from Kathiawar, Ongole cattle from Madras, possibly Kankrej from Gujarat, and local cattle having Mysore-type blood in them were used to evolve the Krishna Valley breed. 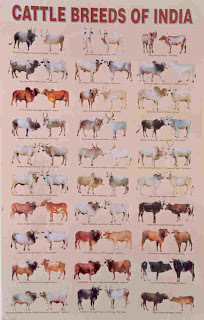 Maharaja Sangli, at one time a well-known breeder of Krishna Valley cattle, contributed substantially in making judicious use of all these strains to produce the desired type of animal which eventually were used for breeding on a wide scale even before the characteristics were fixed to any extent, there is wide variation in the characteristic of the breed. Massiveness in size was the chief dominating factor which attracted the attention of the cultivators. The breed is found in the districts of Satara, Belgaum, Dharwar and parts of Bijapur of Bombay State and also in the native States of Miraj, Sangli, Kolhapur and Jamkhindi which are now part of Bombay State also. 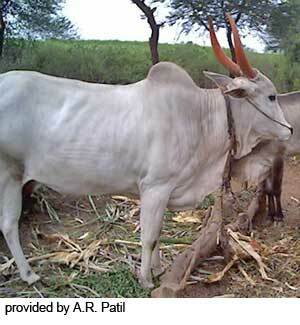 They are also bred in the southwestern part of Hyderabad State.